This Golf Cart Dash Cover fits the Club Car Precedent model. Carbon fiber, Titanium Silver or Wood Grain finishes allow for a customized look. 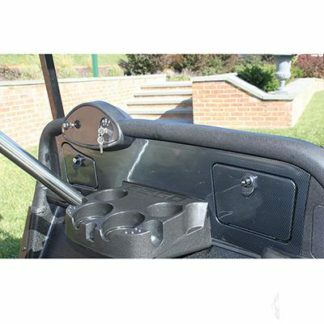 Creates clean functional golf cart dash with locking glove box and cup holders. Includes, Keys, mounting hardware and Installation instructions. (Available in 3 colors) Pete says this Item qualifies for Free Shipping! This Golf Cart Dash Cover fits the Club Car Precedent model. Carbon fiber, Titanium Silver or Wood Grain finishes allow for a customized look that will match you tastes or style of cart. This Golf Cart Dash is the perfect item for those looking to customize and add style and functionality to their golf cart. Now you will have clean looking and functional cup holders, and a locking glove box area for the ladies what nots and stuff. This Golf Cart Dash Cover is also great because now you have more surface area to place light or accessory switches. ( See Images) Includes, Keys, mounting hardware and Installation instructions. Pete says add his golf cart dash trim to completely transform your dash and view from the drivers seat. This club car dash kit is available in three colors, Wood Grain Finish, Titanium Silver Finish or Carbon Fiber.